We have signed mutual non-disclosure agreements with most of our customers. We therefore ask for your understanding that we can only present some of our interesting projects here. This project was implemented for a large German automotive supplier on behalf of Palmarius GmbH. 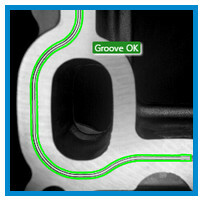 The task was to measure and check the groove width of die-cast aluminum parts. To improve the tightness, the parts are ground and a groove is being milled into the part for a sealing ring. Here sometimes problems occur, for example with uneven sanding or the part is completely untreated. These problems must be detected robustly and rapidly. Heindl Solutions has solved the task with the help of HALCON 12. The parts were first detected and aligned with Deformable Matching. For the inspection of the groove itself, a Bead Inspection Model was used and evaluated with apply_bead_inspection_model (this operator is new in HALCON 12). Local error classes are 'Part not found', 'Groove not found', 'too thick', 'too thin', 'wrong position'. The evaluation on high-resolution images (2560 x 1920 pixels) takes about 50ms for the alignment and 50ms for the evaluation of the groove. The algorithm is integrated as HALCON script with HDevEngine.NET into the application of the customer. For a HALCON project, image processing in real-time was needed. Using RealTime Suite of Kithara Software HALCON was executed on Windows in a real time environment, but then there were issues with the socket communication integrated in HALCON. Heindl Solutions has developed an Extension Package to make special real-time socket methods available in HALCON / HDevelop. The Extension Package consists of 13 operators and was implemented in C++ together with all operator definitions, online help and example HALCON scripts. Thanks to our Git services, the customer is able to see the current status of the development, can checkin own changes or trace the history of changes. The customer got a readily built Extension Package together with all source code.